A little forethought and planning here goes a long way. Before you start packing away your flat screen TV or computer, spend some time getting everything in order. Gather together all your user manuals: If you don’t have them, download them from the manufacturer’s website. Insure your electronics: Consider getting temporary insurance to cover your move, packing, and unpacking. Add tracking to your mobile phones and electronics: Add tracker apps and chips like Tile and TrackR to your electronics so if a phone gets misplaced, it’s easier to find. I’ve been able to move all of my electronic items without damage or problems, including moving everything overseas. It’s all about preparing and packing your devices properly, removing unnecessary items from your devices. Take batteries out of all electronics and remotes so they don’t overheat and leak, and keep them together in one place. Charge up all your rechargeable batteries a couple of days before you move. Eject CDs, DVDs, and Blu-rays from your various devices and tape the drives shut. Remove toner cartridges from laser printers and secure them in a plastic, dust-proof bag. Eject other printer cartridges from non-laser printers and secure the printhead in place. I’ve found that one of the best ways to prepare for moving is to make sure I label everything. Unplugging all of your electronics and labelling them can be time-consuming, but it makes it much easier to set everything up quickly in your new home. This is the process I’ve found to be most effective, and I use it on computers, stereo systems, TV, streaming devices, Blu-rays, and more. Get some small colored stickers (about 8 different colors should be fine), slightly larger white stickers, and fine-tipped pens. Before you pull out any cables (e.g., power, video, audio, etc. ), put a colored sticker on each end of the cable that goes into your devices. Put the same colored sticker next to the cable sockets on each device. Wrap a white sticker around the cable and write the two devices it connects on it (e.g. Blu-ray player/cable box). If it’s a power supply or power cord, write the item it powers on a sticker on the power supply. Remove the cable, coil it, put an elastic band around it, and put it in a sandwich bag with a label. After you’ve put several cables in each bag, secure them to one of the items they belong with. You might want to take photos of the cables before you unplug everything, for reference. You can even take photos throughout unplugging so you can refer to the photos when you’re reconnecting everything. If you’re anything like me, you store lots of important information on your PC or laptop. You don’t want to lose any valuable memories or vital documents, so here’s a way to minimize problems. Back up your important information and data: Before you pack your computer, back up all of your important information onto an external drive or, even better, into the cloud. Make sure your computer passwords are hard to guess: In the (very) unlikely event your tablet or laptop gets stolen when you move, it’s vital to protect your personal data. You can use password managers like LastPass to create random passwords for every website and account, so if someone gets into one, they won’t be able to use the same password to get into everything else. Vacuum and pack the inside of your computer: If, like me, you have a desktop PC, you know how dusty they can get. Before you pack, use a vacuum cleaner extension to remove any dust. This will stop dust moving around and getting trapped when the computer is in transit. You might also want to remove any cards from the motherboard (as long as you know what you’re doing). Make sure everything inside the computer case is secure by tightening all screws. Pack your computer: Use the same method for packing your computer as your other electronic items, but don’t use packing chips (use packing paper instead). Packing chips can cause static electricity to build up, which is very bad for sensitive computer hardware and could stop your computer from working altogether. Remove any dongles, cables, and other items from your computer before you pack it. Start by reading through your user manual to see if the manufacturer has any guidance on how to pack and move your items. Cushion the top and bottom of the box with towels or bubble wrap and pack everything inside securely so it doesn’t move, and fill in any void spaces with bubble wrap or other packing materials. Wrap large items in bubble wrap. If it has a screen, protect it with a towel and another layer of bubble wrap. Place cardboard around the item. Cover everything with plastic sheeting or plastic wrap. Never use newspaper to pack screens. Newsprint can get onto the screen and newspaper can easily scratch screens. Make a list of the items in each box, using our inventory packing sheet system, then mark any boxes as “fragile” and carefully supervise them when they’re being moved. Packing your electronics is only half the battle. Here are some tips and secrets for getting all of your devices up and running again quickly. Now is a great time to buy any new extension cords or power strips. If you’re plugging in a computer or other sensitive electronic equipment, think about getting a surge-protected power strip. This will protect your electronic equipment from sudden power spikes and help it last longer. Unpack boxes in the rooms where you’ll be installing your electronic devices. 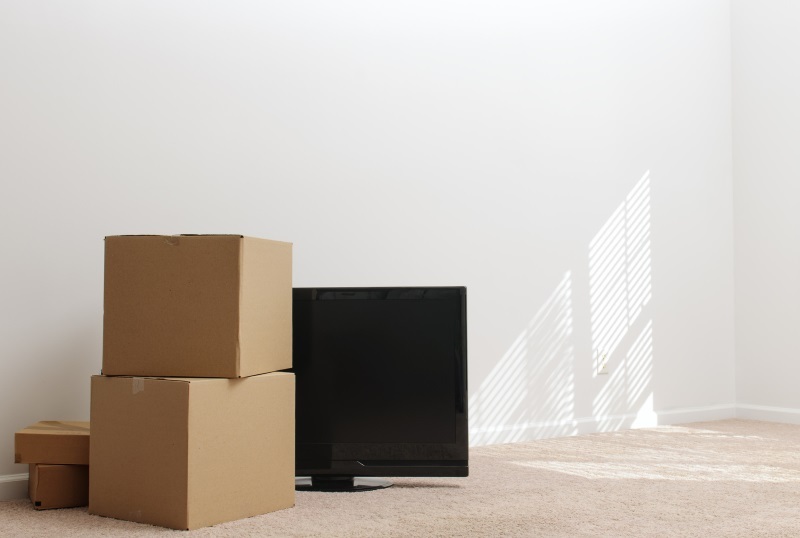 When you unpack, make sure you go through all of your packing materials to find any small items like cables or screws. If you’ve made an inventory of your boxes, check that everything you expect is in the box. Don’t throw away any packing material until everything is up and running properly—I’ve accidentally thrown a computer mouse away—twice. One of the trickiest parts of unpacking and reinstalling electronics is making sure everything is connected together and working properly. Here are my recommendations to make the process as easy as possible. Unpack one electronic item at a time, starting with the one that has the most cable connections (likely your TV or computer). Unpack the cables associated with that device. Don’t unpack any other cables yet. Set the item up and plug the cables in. Use the colored dots, labelling, and any photos to guide you. Once the item has been set up, test to see that it works. After that’s completed, unpack the next item and plug any cables in, test it and check that the two items you’ve connected work together. This is the best approach because you’re testing as you go. If you have any problems, you’ll know it’s likely to be because of the item you’ve just plugged in, which makes troubleshooting much easier. Once you’ve got everything tested and it’s all working, secure your cables together with zip ties. This will keep everything tidy and stops your cables looking like a spaghetti monster. Now it’s time to kick back, relax, and binge-watch your favorite shows!t. Now it’s time to kick back, relax, and binge-watch your favorite shows!